Azure Blue is the new project from Tobias Isaksson, a talented songwriter and colorful profile on the Swedish pop scene. His former bands Irene and Laurel Music were signed to respected Swedish label Labrador Records and attracted worldwide recognition. With Azure Blue, Tobias has made a fresh start and surpassed all his previous work. On the surface, Azure Blue is a sparkling wave that flows relatively unconcerned into a distant sunset, but beneath that it is riddled with references. Together with producer pseudonym Midnight Ruler, Tobias has created a modern yet timeless record with analog drum machines, vintage synths, and airy arrangements. ‘Rule of Thirds’ shamelessly flirts with AOR, New Wave and New Romantic in a way that takes New Order, The Go-Betweens, and Roxy Music's ‘Avalon’ album on a journey to 2012. While lyrically the album is a vortex of references ranging from favorite movies to records to the literary works of Klas Östergren and Ernest Hemingway, it is mostly a touching autobiographical story that processes three ruptured relationships and an inevitable move from Gothenburg to Stockholm. Album opener ‘Fingers’ is an inspired cover version of a song originally recorded by Grant McLennan of the Go-Betweens and the perfect preview of the hypnotic pop found throughout this record. First single ‘The Catcher In The Rye’ sweeps and soars in all the right places and has one of those memorable choruses that sticks in your head for days. Thanks in part to heavy rotation on Swedish National Radio, the song has enjoyed significant exposure already including strong praise in the music press. ‘Seasons’ is an especially ambitious track mixing rich soaring vocals with strings and keyboards that recall the venerable OMD discography. Second single ‘Little Confusions’ is a shimmering pop song that The Cure would be proud to call their own, while ‘Long Way Down’ is earnest and melodic and ‘Dreamy Eyes’ sounds like an early Depeche Mode classic. As it draws to a close, the album exposes its ties to the contemporary Nordic pop scene with the captivating and hypnotic ‘The Shore’ sounding like the best song the Radio Dept. never wrote, and ‘Two Hearts’ starting off like Swedish band Airliner before reaching a wonderfully catchy conclusion. Final track ‘Chesil Beach’ is a poignant letter to a former flame, with sincere vocals set to another hypnotic pop masterpiece. 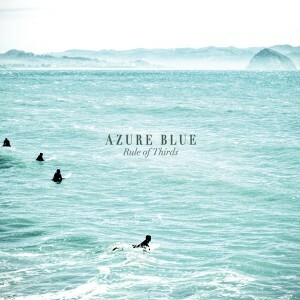 An elegant, melodic and intelligent album, ‘Rule of Thirds’ is a promising debut for Azure Blue and an extraordinary new release for the Matinée catalog. Watch for select Swedish shows late this year and an international tour in 2012.